This is an archive of woodboat questions relating to building a wooden boat. Have a browse through the lists of previous questions and responses or just ask, it’s easy and there is no need to sign in. John is looking for cedar strip, sailboat plans. Where to find a “Personal Watercraft” kit or plans? Can anyone suggest a source of small wooden boat plans for a first time boat builder who wants to build a wooden boat without using plywood? Help or information would be appreciated on building a floatable transom mount for a 90-115hp motor on a 20' Vee Gull. Lewis is looking for any information the “Beer Lug Rig” method of tacking a dipping lug. How can Stuart strengthen his Wooden Cabin top in order to be able to step the mast. Patrick in Florida wants to know how to work out the scantlings for deck and cabin top beams. Jerry from San Diego has a question about using the 'diagonal scale'. How do you determine the size of the center board needed for a 29'8 Motor-sailor? How can Bob patch a 1/4 inch hole in the bottom of his plywood optimist pram dinghy? David in Melbourne, Australia, would love hear from anyone who has built or has any info on the ‘Popular Mechanics PM 38 13ft runabout’. Where can John can get some plans for a 12ft clinker dinghy? How do you join the timber to make a large timber keel in simple terms? Asks Ian from Sydney Australia. Is strip planking a suitable method for building a 15 foot planning hull boat? David from Little Rock Arizona wants to know more about mixing thickened epoxy for his stripper canoe. Stuart, from Cape Town, South Africa, wants some advice on Wiring a Small Boat’s Cabin. Nate's woodboat questions is about the best choice of wood is for a 1" X 1" curved dory gunwale or rub rail. Stuart from Cape Town wants to know your views on the choice of keel type, bilge, drop or long, for his 19' day sailer modification. Moreno in the USA is planning to build a Cape Cutter 19, he wants to know how far apart the ribs/frames should be placed. Could a 15” sailboat be constructed using 4mm 3 ply Meranti if the hull is completely encapsulated in fiberglass-epoxy? Any one know where Robert can fine plans for a 12ft clinker dinghy similar to a Fazackerly? To Ballast or not to ballast that is the question? Should Eddie compensate for the extra weight of larger scantlings and deck house on his SeaHawk planing fast fisher? Hamza from Peshawar in Pakistan wants to know if he can successfully waterproof non- marine grade plywood for boatbuilding. Sandy from Fort St. James, BC Canada, wants to know what is the best wood to use for ribs? Barbara in Sydney, Australia, wants to know what the best timber for making wooden bungs is. Eddie in Ireland would like to know if he can use 3- ply marine plywood to finish off his Sea Hawk instead of the 5-ply he has been using. Al Hubbard would like opinions on which would be best for the interior of a small drift style pram made of stained, marine plywood. Which would you elect from a maintenance/upkeep stand point? 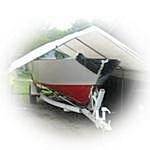 What preparation and primers should Alan use to ensure that the fiberglass doesn't delaminate on his plywood sailboat? What size copper nail should Fred use and how far apart they should be spaced for planking his 18ft lapstrake launch? Mick needs help planning a lugsail to replace the bermudan rig on a weekender he is considering building. Is Poplar strong enough for optimist dinghy mast and sprit? What the best wood is for building the frame of a boat? George is considering building a junk rigged St Pierre dory and wants to know if anyone had any experience with such a critter? Jett-Paul is thinking of building a 19ft flats boat with planking using dowels and glue. Has anyone else tried using Plastic Nails for plywood or strip plank nailing? Alex wants some advice on which timber to use to build a 25ft clinker/lapstrake boat. Greg in New Zealand wants some advice on bending Plywood. What the best product is for covering the screw heads on his plywood 9'pram? Eric in Salem, Ma. would like some advice about the finish to the inside of his magnificent lapstrake boat. Karmina would like to know how you use your boat.